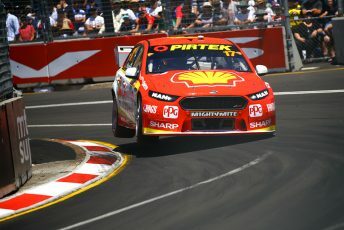 DJR Team Penske had no right of appeal against the penalty that relegated Scott McLaughlin to 18th in Sunday’s race at the Coates Hire Newcastle 500, according to managing director Ryan Story. McLaughlin received three separate penalties during the race, the final coming as the chequered flag fell for his part in a stoush that saw Craig Lowndes crash out on the penultimate lap. In a tense battle for the championship with Jamie Whincup, McLaughlin needed to finish 11th or better to secure the championship. The penalty, which was handed down as a pit lane penalty added 25 seconds to McLaughlin’s race time, which dropped him from 11th to 18th, costing him a maiden Supercars title. The New Zealander disagreed with the sanction. “The rules are quite clear that a PLP or time penalty, a penalty during the race basically, isn’t subject to appeal,” Story explained. “We’ve seen instances this year where we’ve been on the wrong end of the stick and at the right end of it. McLaughlin’s first penalty came early in the race when he was caught speeding entering pit lane, though Story is unconvinced. “It’s a line on the road and if they say we were going above 40(kph), we were going above 40(kph), but it didn’t appear that way from what we were able to digest here in the shed here,” said Story. 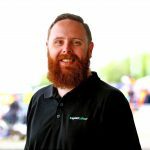 “It gave Scotty a suitable warning when we could see them he should be slowed down but we saw van Gisbergen close up behind him as a consequence of slowing down. “Whether he got back on the gas a bit early or not I guess we’ll have a look at that. “We have to be circumspect about the day in reference to the entire year, and one of the things we said to try and commiserate our troops was it took three penalties to beat us today,” he added. “That’s something that we will take stock of as part of the healing process I suppose. “You want to see a champion crowned at the last event, don’t you? I think that there’s a part of the rationales firmly fixed in that regard.